Pillars of Eternity Walkthrough - A Moment's Respite (Main Quest) - To cure the disease of the main character, you send the caravan master Odema go along with the fighter Calisca to collect some herbs - spring berries. You can find the berries in the northwest of the map (2) - in order to reach them you have to defeat two young wolves. In order to produce a drug from the berries also water is needed, which should get from the hunter Sparfel. Once you have the berries, you can go on the river below the bridge (3) to Sparfel lookout, but only find his water hose. The activation of the hose triggers a cutscene, which reveals that the caravan lured into a hunter’s ambush. The way to the camp area and the camp itself (1) from then on flooded with enemies. Once you defeated them all, including their leader and the subsequent cutscene you wait, the quest is done. Pillars of Eternity Walkthrough - Gilded Vale (Main Quest) - This quest can not be completed in the camp. You have to take care only "A Moment's Respite" for the moment around. Pillars of Eternity is a complex game whose gameplay is influenced by several variables. We strive to keep this solution as completely as possible. However, it may be that certain solutions are not quests for our character available throughout the game. It would therefore be mentioned at this point that the solution relates primarily to a human mage with high intelligence and power attributes. But in most cases, the solution is also valid for any other race and class. The game is played on Hard "heavy" - that has an impact on the type and number of enemies that appear throughout the game. The encampment is to be understood as a kind of tutorial area and mainly serves the purpose to familiarize new players the control and game mechanics. At the beginning you are in the encampment area (1), where the caravan master Odema involved in a conversation. You can learn from him, among other things, that the caravan has stopped because of an approaching storm, and that it probably is the disease that plagues your character. For the treatment of water and is an herb / drug which is produced from a spring berry. So you also have your first two and only in this area quests, namely to seek the way to Gilded Vale and a spring berry. If desired, you can learn from Odema something about the storm - the caravan master believes that it becomes a Bîaŵac, a particularly dangerous and deadly storm. He also explained to you what it is. Adras, so the bright green stones that grow above the bearing from the ground, is all about and gives you some information about the ruins in the region Once you "Then you'll go look for these berries." replied that ends the conversation. Odema gives you human fighter, Calisca temporarily joins the group. This is especially for characters with low health points of advantage because Calisca withstand much and can pull the attacks of the enemy up. The only other option at the camp area is the dealer Heodan. From it you can buy melee and ranged weapons, armor, potions and picks. Picks can possibly for the opening of the container right in the camp area, near the cart, buy. If your character has at least one point in mechanics, but it can also open the container without lock picks. You can talk to Heodan yet about his origin and the Aedyr Empire - but that has only informational value. When you're done in the camp area, you should first go to the east and enter the small, fragile walls of framed area with the stables. At the northeastern wall slice of mushroom Orlan's cradle, which you can use for crafting liable. A short distance south there is a fallen tree, which you can ignore. Instead follow the wall under a fallen tree in the center of the map and embark in the bottom of the map area. If you go down the river to the southeast, you will meet two corpses. The right body a breastplate and a decrease Dietrich. If you follow the river back to the west, you come across a bridge. Cross it, and you will find a campfire with two tents and a floor full of footprints that have recently emerged. Take the beer from the right tent, cross the bridge again and make you then set off to the northwest. There are three areas that are separated by a wall, or rocks. The left and right part you can pick Crafting items (Burned lady and Admeths Wyrt). In the central region (2) you will meet two young wolves and a dead deer. Also, you can remove one of them, the wolf skin. When the wolves are defeated, you can go the way up and pick the spring berry. This is followed by a discussion with Calisca where you can learn sometimes that she joined a worrying letter from her sister out of the caravan. She provides you questions about your past and your motivations to travel with the caravan. Once you finish the conversation suggests Calisca, the hunter Sparfel inculcating some reason. That should really get the water for your character. Make your way to saving rock water hose (3) just south of the bridge that crosses the river. At the point would be a good time to latch briefly, because as soon as you activate the tube, a text window that explains why Sparfel has the water hose left lying so carelessly and it is followed by a struggle to appear. Hunters have lured the caravan into an ambush. Two of them have killed and now attack your group. You first concentrated on the archers and then attack the melee, then you should prepare the fight no difficulties. In addition to an arc and a Raw skin armor you leave the hunters eleven copper coins. Run back to the camp area (1) and switch go about in the center of the map three more hunters, carrying two tomahawks, two Medium round shields, three Raw skin armors, ten pieces of copper, a hunting bow and ten copper coins with you. Once you've defeated the three, you should save them again. The camp area is like now a morgue. It seems as if only Heodan alive - the leader keeps him a sword to his throat and asks you to lay down your weapons. Otherwise, he would kill him. No matter what you say in the first approach, the leader is in any case a second time to urge you to lay down your weapons. It opens up then a selection of dialog options, depending on the attributes of your main character. A maximum of nine options there are in total. Options 1, 2, 3, 4, 5, and 9 all lead to the fact that the leader a stitch offset - then a fight breaks out, a participant in the Heodan with bruised ribs (-20 bravery, -2 Constitution). Option 8 gives the same output, but also your group does not hold any more weapons. The seventh option is the most attractive solution, since it means that the leader without prejudice to dismiss from his grasp - after he comes to the fight, but Heodan closes without prejudice to the group and participates with full strength. The leader has three hunters at his side, who rely on melee weapons. Accesses best with all group members until the leader is defeated, the hunter a breeze. If you have won employs a cutscene. It turns out that Odema is not yet dead, but only seriously injured. The moment in which the leader breathe out his life, but breaks out Bîaŵac. For Odema so there's no hope, and he calls his last breath on your group to flee into the ruins and bring so in safety. Further action is described in a text window. 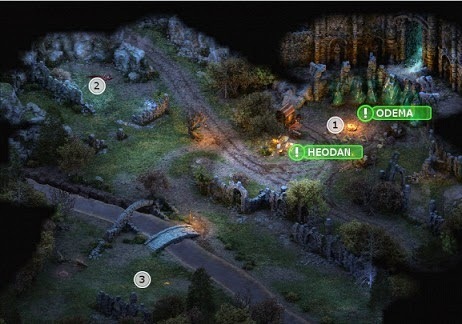 The group runs a steep slope up - your main character and Calisca make it into the ruins, Heodan comes because of his injuries has been slower and then stopped even by a presumed dead hunters. You can save Heodan by either you throw your weapon on the Hunter (requires at least 15 points in agility) or attacked him with a ranged attack (requires a ranged weapon or spell). If you make the decision to Heodan left to itself, then it is entrained by Bîaŵac and dies.